Ten venues will be hosting new shows during November. First Friday, hosted by Avenue for the Arts, is on November 4, 2016, from 6 p.m. - 9 p.m. 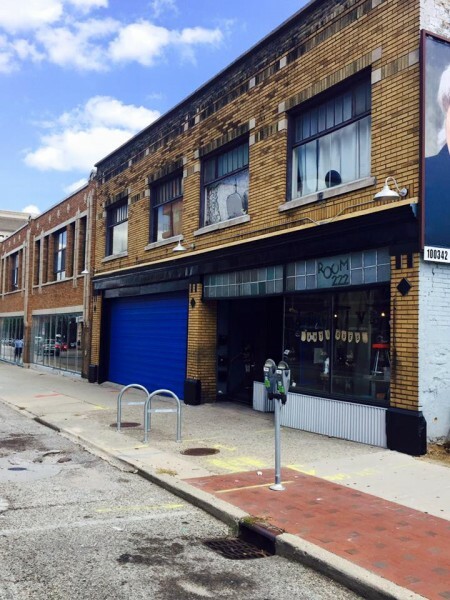 Studio 341, 337 Project Site, The Light Gallery + Studio, Avenue for the Arts [Gallery] Space, Dime and Regal, East Meets West pop up, Archive Antiques, Parliament the Boutique, Woosah, Cerasus Studios, Spiral Gallery, the Collective Artspace and the UICA. For the last three years Steven Vinson has operated Spiral Gallery, located at 44 S. Division Ave. Steven has been involved with the Avenue for the Arts as a graduate student, gallery owner, and a faculty member at Kendall. “There’s definitely a sense of community, especially with people that have been involved with it for a really long time because they’ve invested so much and seeing how excited they all are, how invested they are, how hard they all work…it’s definitely respectable. You feel better for being a part of it.” Like many of the faculty at Kendall, he appreciates the Avenue for what it does and feels that both it and First Fridays are necessary for the art culture of downtown Grand Rapids. On First Fridays, “I love them, I think they’re great...I like having new work up, I like being able to go see the stuff that other galleries have," Vinson said. Less than a block away, Stafford Smith has been doing just that. 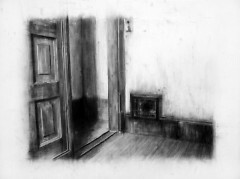 A longtime photographer and current associate professor at Grand Valley State University, Stafford opened a personal photography studio at 341 S. Division Ave. that he also utilizes as a gallery space. He tries to fill it with work he finds interesting, even if that person doesn’t consider themselves an artist. The current work up in the gallery is a series of beautiful Instagram photographs by musician and actor Chris Eddy, a friend of Stafford’s. “I never thought of him as a photographer and I don’t think he ever thought of himself as a photographer, but there are a lot of examples of people who never really thought of themselves as artists being seen that way,” noted Smith. Stafford Smith’s gallery is a great addition to the artistic culture of the Avenue, as he has been pushing the boundaries of displayed art with his current show of Instagram-only photos and previous shows, such as a surveillance-focused collaborative show with his wife in September, with surveillance cameras recording visitors to the gallery and projecting their image onto the gallery around them so they became both part of and the focus of the installation piece. Neither the community nor the Avenue for the Arts are static. There have been several new locations opening in recent months, including Archive Antiques. Archive is located at 222 Division Ave. S. and is owned and operated by Carmen Besemer and Mark Herring. Inside the store are a multitude of antiques, many of which have been repurposed and range from license plate keychains to a piano that has been re-built as a bar. They were quick to become a venue for First Fridays. “They’ve been wonderful! People that are aware of it are rather loyal to it…It’s nice for the businesses because they’re pulling in people that maybe weren’t aware they were there,” Besemer said. For people like KelliJo Peltier and Steve Vinson, the Avenue has become a place of great memories and moments in their lives and will hopefully continue to create these moments with events like First Fridays and The Market. Garcia's “New Realism” show is now a fond memory for him and the other artists that were involved, helped by all the people who stopped in to appreciate pieces each artist devoted small parts of their lives to complete. Each time First Fridays happens, new fond memories are being created and each artist feels the support and appreciation of the people like Peltier and the business owners that are First Friday venues like Besemer and Herring of Archive Antiques, who love having art on their walls, or Steve Vinson and Stafford Smith who actively support artists by having larger shows. Featuring artwork that showcases unimportant places that hold meaning for the artists whose work has been shaped, in part, by the memories and experiences of that place, “Unimportant Places” showcases Amanda Carmer-Rainey, Ashlee Lambart, Christian Helser, Damian Goidich, Megan Kellner and Ryan Wyrick and opens Friday, November 4, 2016. 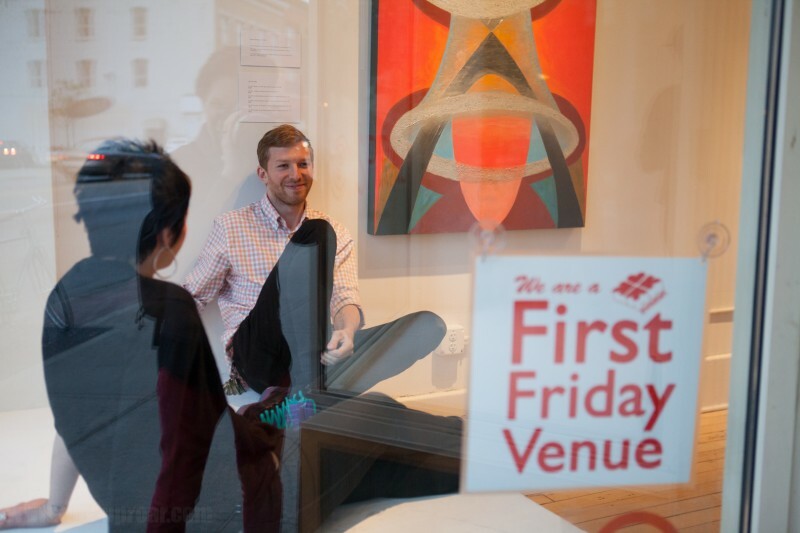 For a complete list of First Fridays venues visit the Avenue for the Arts First Friday Facebook page. For a current list of all First Friday participating sites, visit the Avenue website. The Avenue for the Arts is a neighborhood title for the South Division commercial corridor. We are residential, commercial and nonprofit groups working together in a creative community. We are residents in Heartside, and active participants in shaping change in our neighborhood. In 2005, we choose the Avenue for the Arts as a title to represent our commercial corridor and the projects and events that we create. Because the Avenue is powered by volunteers guest writers create our Rapidian content. Special thanks to Justin MacAuley, Avenue member, Freelance illustrator and illustrator for Little Studio Space, located in Grand Rapids, MI for his coverage of The November First Friday.